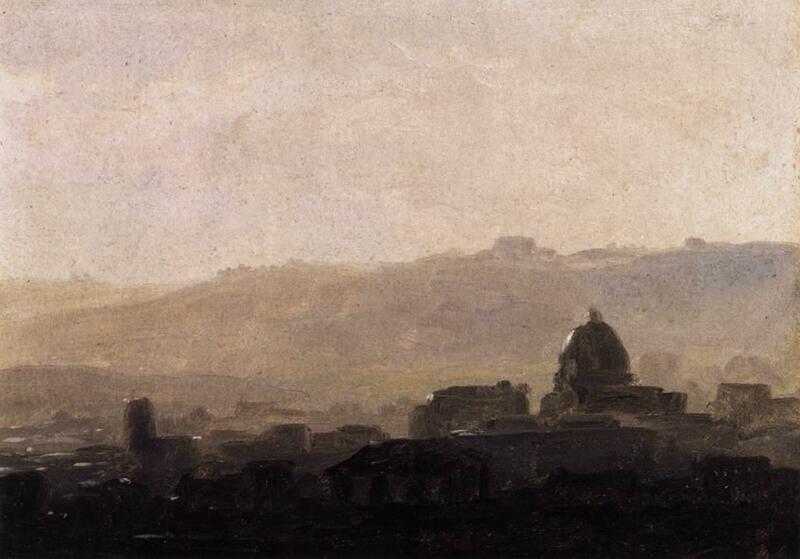 Thomas Jones, The Capella Nuova outside the Porta di Chiaja, Naples (1782), oil on paper, 20 x 23.2 cm, Tate Britain, London. Wikimedia Commons. Two modest and simple landscapes, some of the first painted outdoors or ‘plein air’ using oil paints, which paved the way for Constable, Turner, and the Impressionists. Pierre-Henri de Valenciennes, (Title not known) (c 1783), oil on paper laid on canvas, c 18 x 28 cm, Musée du Louvre, Paris. © 2015 EHN & DIJ Oakley. Thomas Jones, A Wall in Naples (c 1782), oil on paper laid on canvas, 11.4 x 16 cm, National Gallery, London. Wikimedia Commons. The Roman Campagna in fair weather, lit from the front right of the viewer, under a bright sky with abundant white clouds. In the foreground, at the left, trees along the height of the left edge, next to which is a palm, forming a repoussoir. In the centre a shrub with prominent red flowers, light earth and vegetation forming the ground. Behind that dark cliffs dropping to a river below, all in deep shadow, with silhouetted vegetation and buildings along the top, which passes from upper left down to mid right of the view. Behind those in the distance, a brightly lit plain with trees and buildings, and two prominent towers. Behind those rugged hills. The whole arranged in alternately lit and dark planes of triangular form. The wall of a building, a slice of deep blue sky above, and a small section of brightly lit building at the top left. In the middle is a window with a balcony. 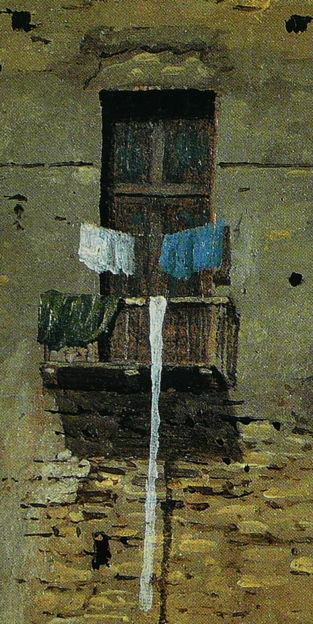 On either side of it hangs washing, blue and white, with darker garments hanging on the rail of the balcony, and a long thin band of fabric falling far below. Another window, without balcony, is at the left edge, and a thin line passes horizontally from that window almost to the right edge. 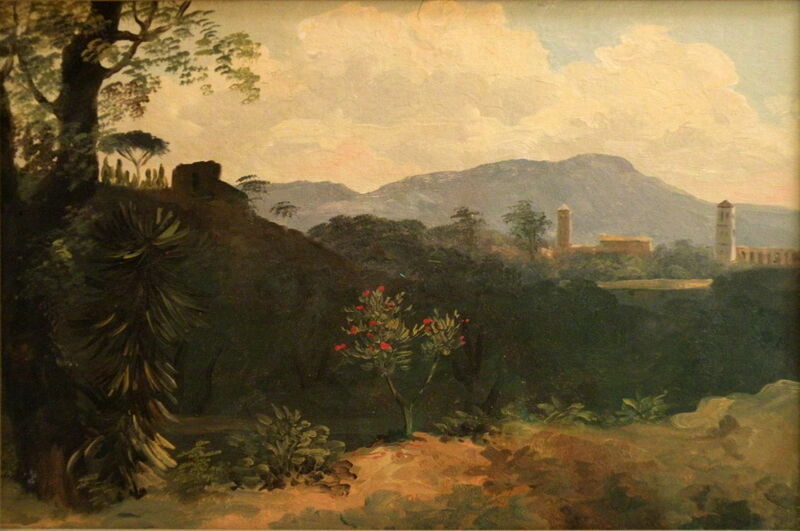 At the right foot of the painting is scrub vegetation. The wall is mostly rendered, with various stains and other marks over its surface. In other parts the underlying stonework shows proud. 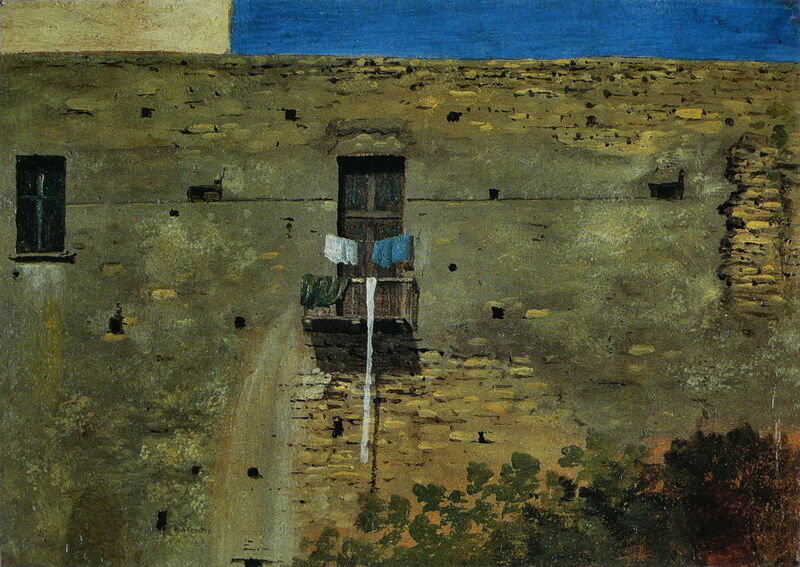 Thomas Jones, A Wall in Naples (detail) (c 1782), oil on paper laid on canvas, 11.4 x 16 cm, National Gallery, London. Wikimedia Commons. Each of these two paintings has been executed in oil paint on a paper support, and appears to have been (largely if not completely) painted en plein air, in front of the motif. Pierre-Henri de Valenciennes was born on 6 December 1750 in Toulouse, France. He studied locally, and then undertook an apprenticeship there. In 1769 he visited Italy for the first time, returning to work in Rome between 1777 and 1781, when he started to paint plein air in oils, after which he travelled to the Middle East. He returned to Paris and was admitted to the Academy in 1787. He published an influential manual of perspective and painting in 1799, and became Professor of Perspective at l’École des Beaux-Arts in Paris in 1812. He died on 16 February 1819. 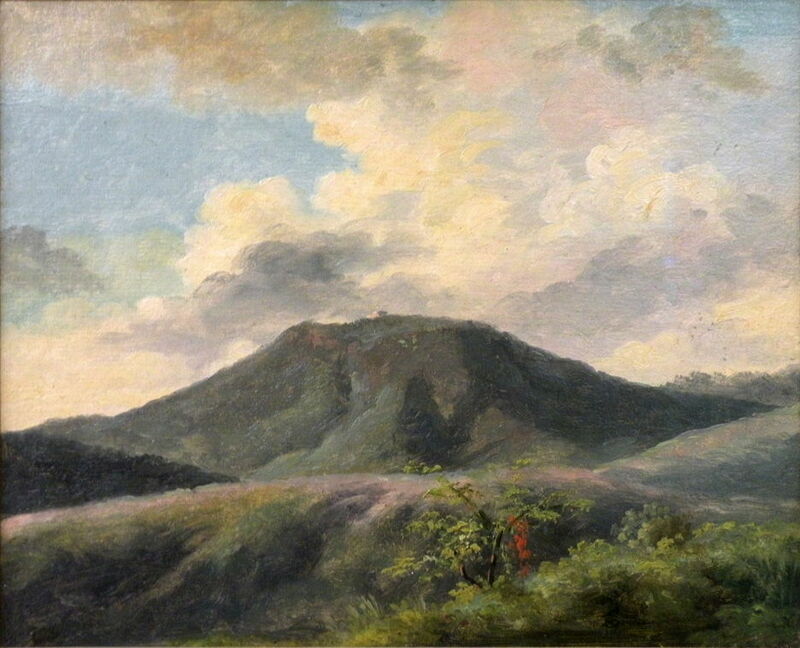 Thomas Jones was born near Llandrindod Wells in Powys, Central Wales, on 26 September 1742, dropping out of Oxford University in 1761 to pursue a career as a painter. He became a pupil of Richard Wilson in London in 1763, and started making landscape sketches in oils in the 1770s. He worked in Italy from 1776 to 1782, around Rome and Naples, where he completed many plein air paintings in oils, as well as commissioned works in the studio. For the first five years following his return he struggled to make a living in London, but when he inherited the family estate in 1787 he was able to use his techniques in the landscape around that estate at Pencerrig, near Builth Wells. He died on 29 April 1803. Prior to 1800, the great majority of landscape painting was undertaken in the studio. Painters would usually make studies and sketches outdoors, using pencils, charcoal, pen and ink, watercolours, and media other than oil paints. These would then be brought back and used to create large, detailed oil paintings. Pioneers of outdoor oil painting are thought to include Velázquez, who in about 1634 made oil sketches of the garden of the Villa Medici in Rome, and Alexandre-François Desportes, who specialised in animal and hunting portraits but around 1700 painted some plein air views in Italy. However these isolated experiments did not catch on. In the late eighteenth century landscape painters started to venture out into the Roman Campagna with oil paints and the tradition of plein air painting started. Among the earliest were the Welsh artist Richard Wilson and his pupil Thomas Jones, and the French Pierre-Henri de Valenciennes. Sadly none of Wilson’s plein air oils seem to have survived, but Jones and Valenciennes left remarkable paintings from that period, and thriving groups actively painting en plein air. Pierre-Henri de Valenciennes, (Title not known) (c 1783), oil on paper laid on canvas, c 18 x 25 cm, Musée du Louvre, Paris. © 2015 EHN & DIJ Oakley. Even today, with tubed paints (introduced after 1840) and many other tricks to make it easier, oil painting plein air is a daunting task. When Jones and Valenciennes were active, oil paints had to be prepared in the studio and carried to the motif in small bladders made from animal parts. Easels were heavy, and simple practical matters such as transporting wet paintings back from the site would have been difficult. Thankfully the warm, sunny and stable weather in the Roman Campagna, together with plentiful attractive ruins and views, proved an ideal setting in which the techniques and skills were to develop. Plein air painting is not just limited by the length of daylight. As the sun moves round the sky, shadows move and the whole motif is transformed. Early plein air painters learned that spending much longer than an hour or two on a painting made it increasingly difficult to capture consistently, so were driven to paint quickly and to simplify what they painted in order to complete in that time. 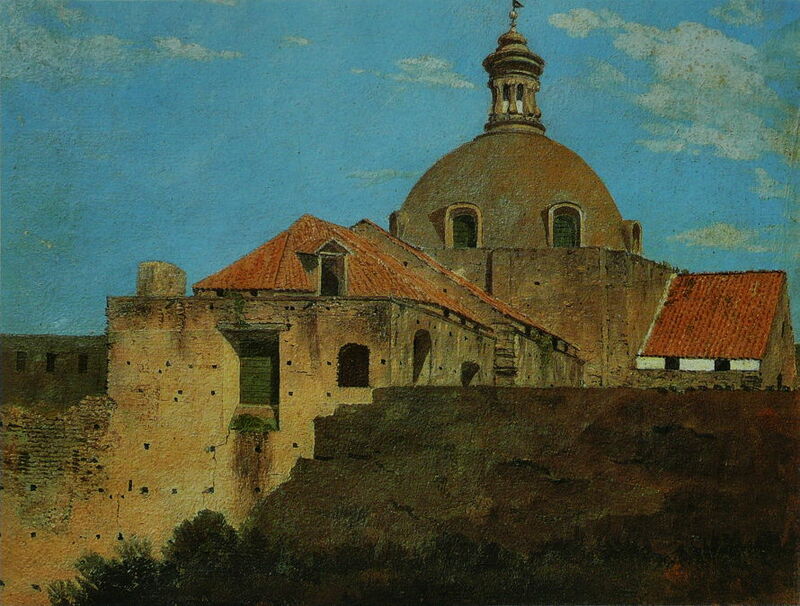 Pierre-Henri de Valenciennes, Rome: Houses and a Domed Church (c 1783), oil on cardboard, 18 x 25 cm, Musée du Louvre, Paris. Wikimedia Commons. The principles and techniques of plein air painting were central to those of the Impressionists nearly a century later, and there is a direct lineage from Valenciennes to the core group of Impressionists: Valenciennes taught Achille Etna Michallon, who taught Camille Corot, who worked closely with Charle-François Daubigny, who together in the Barbizon School were major influences on Monet, Pissarro, and even Cézanne. These wonderful plein air paintings are therefore the first steps on the road to Impressionism. Meanwhile in the UK, Richard Wilson and Thomas Jones established landscape as a respectable genre in painting, and plein air as a perfectly good means of achieving it, ready for the likes of Constable, Girtin, and Turner. The constraints of painting plein air – light, time, and simplicity of equipment – force the painter to choose clear and simple motifs and to simplify what they are depicting. There is no time or appetite for including elaborate detail, and plein air paintings may appear ‘unfinished’ when compared with studio paintings of the day. As they adapted composition and methods to get the best out of outdoor work, Valenciennes and Jones were unwittingly becoming impressionist in their style, almost a century ahead of their time. The results are wonderful little paintings which had a freshness not seen in their formal studio work. There is a remarkable shortage of accessible information on plein air painters prior to Impressionism. Posted in Painting and tagged Corot, Impressionism, painting, Pissarro, plein air, Richard Wilson, Thomas Jones, Valenciennes. Bookmark the permalink.